Korin Japanese Trading Co. in New York boasts the most comprehensive collection of Japanese knives in the world—in fact even more so than Japan. Located in Manhattans Financial district Korin is a must visit shop for anyone who loves to cook, and has an eye for quality. 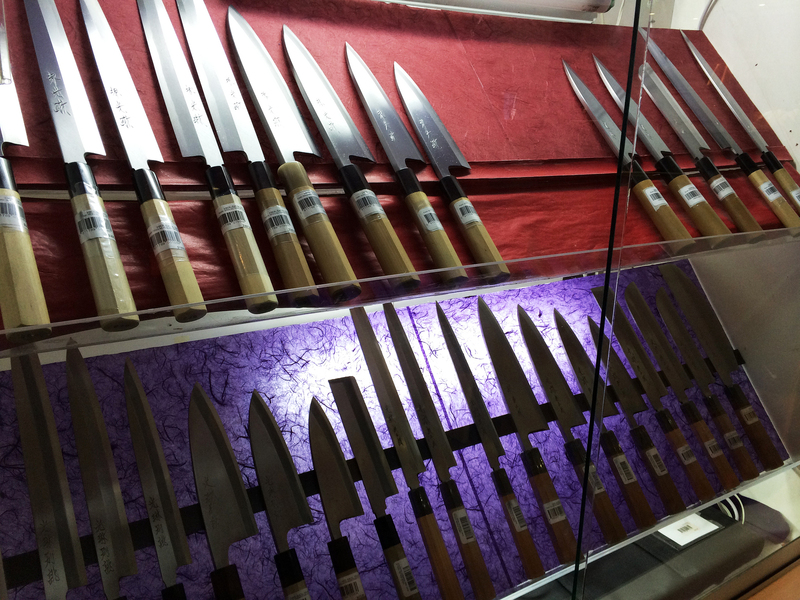 The prices at Korin might shock you a bit if you're use to getting your knives from your local department store. The prices do range quite a bit though, one of the more expensive ones we noticed had a price tag of $7,500, while others were just a few hundred. Keep in mind that these are professional quality knives and are meant to last a life time, so you are investing in a piece that you won't soon need to replace. If you cook daily try doing the math over several years and you'll see the cost of a good knife really does work out to very little per day. Chefs don't hesitate to purchase a good quality knife because they know it will elevate their cooking, and speed up their process. Plus, if you decide to go with one of the tradition Japanese knives (they carry several different types) you'll be eligible for free maintenance, which includes chip repair. You'll find a range of knives some Japanese (single-edge blade) and some Western (double-edge blade). The Japanese knives are extremely sharp and fine, which is necessary for Japanese cooking. Korin knives are crafted from carbon, cobalt, stain resistant, Tamahagane, and Shiro-ko steels, each with their own distinct qualities. Which type you choose largely depends on the type of cooking you'll be doing. The shop also sells sharpening stones and a range of accessories to store and care for your knives properly—something you'll definitely want to do considering how expensive they are. More than just knives you can also find specialty tableware, quality cutting boards, and professional rice cookers among other things. Although this is primarily a restaurant supply company, at-home-chefs looking to up their cooking game are welcome to shop as well. Everyone gets treated the same, weather you're buying a large order or a single item all your questions will be answered by Korin's knowledgeable staff, and if you're a novice they'll explain everything you need to know to care for your purchase.